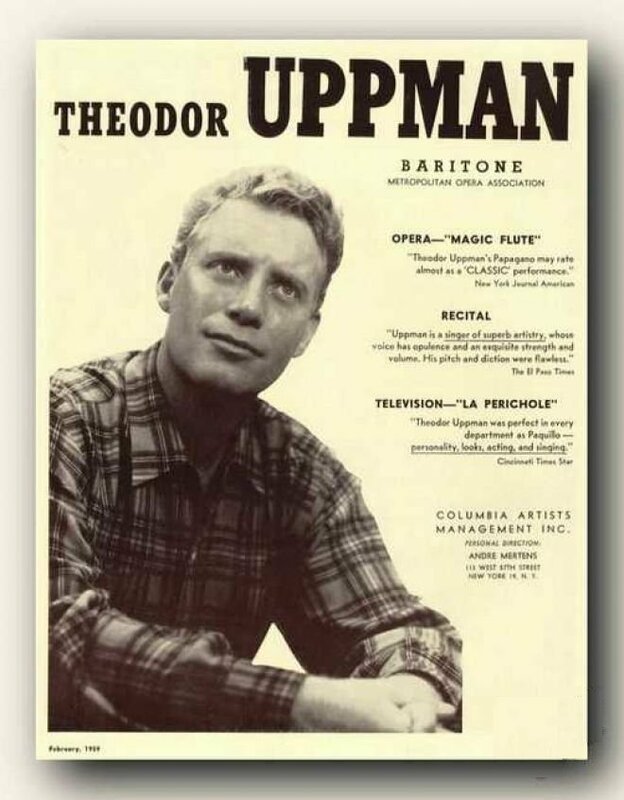 Theodor Uppman Interview with Bruce Duffie . . . . . .
On one of my rare visits to New York City in March of 1988, I conducted a few interviews. Most were pre-arranged before I left Chicago, but through the kindness of a mutual friend, I was able to secure (at the last minute) a visit with baritone Theodor Uppman. I had admired his artistry for many years and was especially glad to be able to speak with him in the comfort of his home. It was as though he had not aged a day. His appearance was just as I remembered, and was exactly as it appeared in all the photos from throughout his career. He said that though he had not sung in Chicago for awhile, he remembered it as a happy place. Indeed, at Lyric Opera he had appeared in Don Giovanni and Ariadne auf Naxos in 1964, and as the title character in Billy Budd in 1970 with Richard Lewis and Geraint Evans. He also told me he did not particularly like doing interviews, but in the end was genuinely pleased with what took place that afternoon. As we were setting up, I thanked him for seeing me on such short notice, and gazed about the room which had an abundance of plant life . . . . . . . . .
Bruce Duffie: I love your place with all the green around. It’s very nice. Theodor Uppman: Yes, it’s bright here. It’s nice, always sunny — when there’s sun. We try to fill the place with as much light and happiness as possible. There are pictures of our grandchildren over there, also Peter Pears and Ben Britten on the piano. BD: Who is the harpist — is that Ellis? TU: That’s Osian Ellis, yes. He stays with us when he’s here. So did Peter and a lot of people. It’s kind of nice; I’m sort of the British hotel in New York! BD: Then let’s start with Billy Budd. You sang the premiere? TU: Yes, I was the original Billy. BD: That was in four acts? TU: Yes, it was in four acts at that time. I think it was not until 1960 or so that Britten decided to rewrite it a bit and put it into two acts. BD: Which version is better? TU: I personally like the four act version. I still have that feeling. I don’t know whether it was because I did it that way originally or not. BD: What’s different about the four act and the two act versions? TU: The difference, really, is not all that much, except that there are certain parts that have been left out now. In the end of the second act, there’s this wonderful scene where the Captain is greeted. Now most of it’s cut, and it sort of goes almost immediately to the point where they are asked to leave the ship, to go below. I’m trying to think exactly where that is now... I probably shouldn’t say until I’ve looked at it! BD: That’s all right. I won’t hold you to details, but you feel it’s still a very strong work? BD: Is it a gratifying character to portray? TU: Oh, I found it tremendously gratifying! Britten himself said, “I didn’t realize that you were there in California, but I feel as though I knew you, and that I wrote it for you,” because it was just so ideally suited to me. BD: Can Billy be played too pure? TU: Yes, I feel that you have to be a little careful. There’s a borderline, and you mustn’t become prissy. You mustn’t get to the point where you feel that he is so good that he’s not capable of any feelings other than just godlike feelings. But he is, of course, the closest to the personification of good that I have ever encountered in an opera. It has to be pretty strong; the pure side must be as strong as possible in order to have the strength of the evil Claggart counter it with strength. BD: Is Claggart as evil as Billy is pure? TU: I would say so. Yes, he’s a very evil man, and unfortunate. I’m sure there must have been something in his background. We know some people like that, who just don’t seem to be able to take goodness. They have to fight it and they have to somehow or other get the better of it. There’s always that homosexual idea, too, that’s in back of it. When the opera was being done here at the Metropolitan, several of the cast came to me and asked me about this. Did Britten ever stress that, or did the directors stress it, and I said no, they didn’t. It’s in the music. If it’s there, it’s there, but there’s no necessity to make it that evident. I think that Claggart probably did have homosexual feelings, and that he knew that Billy was unobtainable. So he was going to get the better of him somehow. BD: Is there anything special that you expect of the audience that comes to see this particular piece — anything different than, say, The Magic Flute, or any of the other operas that you sing? TU: I think the audience, if it comes to Billy, is usually an audience that has to be pretty sensitive and, what should I call, a literary type of audience. The Magic Flute is a little more understandable, although one must say [laughs] that the plot of The Magic Flute is a little involved and perhaps weird to some people. But Billy Budd is a psychological thing, and I think that it takes more understanding on the part of the audience. Whether it ever will be as popular as The Magic Flute, I don’t know, but I doubt it. But to me it’s one of the great works. Of this century, it certainly is outstanding. I love Peter Grimes, and I like all of his operas very, very much. But I feel that Billy has something because I was such a part of it. But it’s a great work; it’s a great masterwork. BD: Were you involved in helping to write it? TU: No, no, I didn’t know it was being written. It was something that came to me just out of the blue. They’d been looking for a Billy all over the world, apparently. They said so, at any rate, that they’d tried to find someone on the continent, and of course in England, and finally came to New York to audition people. At that time I’d just left New York, actually, and gone back to California after having done a musical comedy on Broadway. I’d been here to do a debut recital in New York, which went quite well and was successful. But while I waited for something to happen I needed to have a job, and so I was put into this musical, Courtin’ Time. When that was over, I went back to California. After I’d been home for almost a month, Alfred Drake, who had been the director, called me. I’d been working in an aircraft factory! I was made superintendent of the oil and acid department at Bendix Aviation. So Drake said, “Ted, you’ve got to come to New York. This, I think, is a role that would be ideal for you. They’re looking for someone, and they haven’t found anyone yet.” I said, “Alfred, I can’t leave. I’ve got a job that’s paying me at least enough to keep my family together.” He said, “Well, I think you should do it. We’ll try to arrange for it.” I couldn’t really afford to fly back again, so, to make a long story short, I left on a Friday afternoon. My wife met me at the factory and I changed on the way to the airport. Then I flew back on Monday morning, a little late for work. She met me at the airport again, and they didn’t know that I had been gone. [Both laugh] So a week later they called from London and asked me to take the next plane. I hadn’t known Billy at all before that, and I had to work very, very hard to learn it. I had really just about a month all together. BD: Did you sing other Britten operas? TU: I did some roles in Gloriana when it was done here for the first time. That was a concert version during the May Festival in Cincinnati in 1956, with Josef Krips conducting. BD: That’s a great opera. I’ve heard it on a BBC broadcast, but it’s never been recorded. BD: Did the role of Balstrode suit your voice? TU: Yes, it was pretty good. It was within my range. BD: I think of him as a little deeper, more of the Claggart figure. TU: Well, it is at the bottom of my voice, but I sang a lot of roles that required more bass-y quality. BD: So how did you decide which roles you would accept, and which roles you would decline? TU: Luckily at the Met, I made my debut as Pelleas in November of 1953. After that, my next one was Papageno in The Magic Flute. BD: That was back when they were doing it in English? TU: It was back when Bruno Walter was conducting, yes. Then I did things like Marcello and Sharpless, and I did La Perichole, of course, Piquillo in La Perichole was originally written for tenor, but in the version done for the Met it was written for me, so they made it a little more baritone-ish, here and there, at any rate. I guess they were alternate notes. BD: Of course Pelleas, too, is often done by a tenor. TU: Pelleas is done by a tenor very frequently. I don’t know whether it is more than it is by baritones. I think that actually the baritone finds it easier to sing because a great deal of that role is down in the lower part of a tenor’s voice. It goes down to a B below Middle C, and it’s difficult for some tenors to sustain that lower tessitura. That’s where a lot of the very sensuous, very beautiful sound that Debussy puts into the role of Pelleas is. It stays down there frequently, so baritones find it almost easier to sing. It was the first opera, really, that I ever learned professionally. Before that I had done things like Così and so forth, but I did Pelleas first with Monteux in San Francisco, with the San Francisco Symphony and Maggie Teyte, of all things, at the age of sixty-four, I think she was. BD: Her hundredth birthday is just rolling around. We’re going to celebrate it with a recording from Town Hall in which she sings a number of the roles in Pelleas. TU: Right, oh yes, she loved doing that! Sings a little bit of Pelleas, as well as Melisande and Genevieve. BD: Tell me about working with Maggie Teyte. TU: It was wonderful working with her! We really hit it off quite well, and after that San Francisco performance she asked me to come to New York to do it with what was then the City Center Opera, which has become the New York City Opera. I had done the performances with her the year before in San Francisco, and so that it was a bit of a chore for me to get that put together and do it for the first time onstage. But she was just a tremendous help to me. At that age she was singing with such beauty, with such purity of sound! Just listening to her and talking with her I think helped me tremendously. My actual placement of voice I got from her, I think, which has been one of the things that’s helped me more than anything in my career. Strange how that will happen. The head resonance she stressed so tremendously, and it certainly is the thing that every good singer should have in order to sustain a career. BD: Is this something you’re trying to pass on now to younger singers? TU: I’m trying to do that, yes. TU: Well, with a few! I’m getting a little bit choosy these days. I’ve had several students who just haven’t got the interest or the desire. They think they’ve got everything already, and they won’t listen to a singer who’s been around, singing for forty years! BD: What does it take to make the big career? TU: First of all, it takes a voice, of course. There’s got to be a voice there somewhere. I don’t believe that a voice can really be built. It has to be a part of you and in you. It can be helped by proper study — by learning how to project what you have — but it has to be there, and the desire has to be there. You must realize that you cannot let up at any point in your career if you’re going to sing properly. You constantly have to build; you have to refurbish, so to speak. If something is beginning to wear a bit, you have to go back and say, “Why is that happening?” and unless you have the right tools to do that, the voice is going to suffer. It won’t last. We can see that in — I won’t mention any names, but there are a lot of very, very wonderful singers around who suddenly find their careers just falling apart. BD: Is this something that the singer himself or herself can hear, or must it be someone out front hearing it and telling the singer that it’s happening? TU: I think it has to be another ear, someone listening who is very concerned and understands what that voice is about. It can’t be done by just anyone. It must be done by someone who has sung himself, or has heard enough of what is beautiful singing, what is wonderful placement of voice, and can tell this person exactly what the problem is, where it’s going, and what can be done to remedy the situation. Oh yes, it can’t be done wholly by the singer himself. You have to have another set of ears. BD: We talked about a number of roles, but how exactly did you decide you will do this role, you will do that role? What did you look for in each role that told you yes or no? BD: Does he know right from the beginning he’s going to find Papagena? TU: No, he sure doesn’t! [Both laugh] At some point, of course, he’s ready to commit suicide, as you know. BD: Would he go through with that? TU: [Laughs] I don’t know! The boys do save him. Because of the lyric quality of my voice, at the Met particularly, I wouldn’t have done a role like Rigoletto, or even Germont. I could have done them, and I did them in other houses, but in a big house I realized that these were not the right things for me to do. BD: Did you adjust your technique from the big house to the small house? BD: You adjusted the roles, then? BD: Are audiences different from one city to another, or one country to another? TU: Yes, they are. I’ve noticed a difference. In London, before I went there I’d heard that the British were very reserved, so I was not to expect too much enthusiasm, and so forth. But it was not true. They just absolutely went wild over this Billy Budd in the opening performances, especially. I was very thrilled with that, but it isn’t the kind of audience that you’d find in Italy, or even here. We are much more demonstrative, I think, at the Met. The bravo-ing and the things that go on — even the whistling, which is very disturbing to Europeans. For them, whistling is usually done when the audiences don’t like something. They’re trying to whistle you off the stage. I finally got to La Scala and to the Vienna Staatsoper in the last few years. After a forty years or so, I feel that my career has been pretty complete. I would still like to be singing regularly at the Metropolitan, but that was not to be, apparently. BD: But you sang there up until a year or so ago, did you not? TU: The last performance I did there was in ’78, ten years ago. But I’ve sung a lot of other places in the meantime, and in some ways it’s been a good thing because I was really kind of stuck there. I remember Ben Britten would try, during those early years, to get me back to England to do more performances of Billy Budd, but I could never leave. He would always wait until a little bit too late. My season had been settled with the Met, and then I couldn’t get away. BD: Do you wish you had made the recording of Budd? TU: I did not really make any major recording of operas. I did some of the smaller ones that were done in the early days. 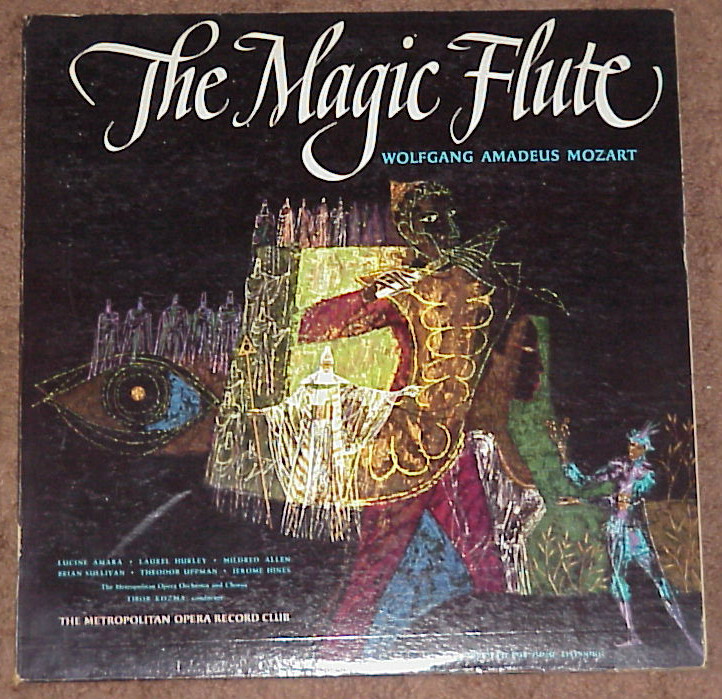 In the fifties and the early sixties I did abridged versions with the Metropolitan of The Magic Flute [Note: cover of the recording shown below] and La Perichole and Escamillo in Carmen. But I have not had a real recording career. The things that have been done have been sort of done especially for me. I did one recital recording, and I did the Fauré Requiem, things of that sort. BD: You’ve also done some musical comedies. Are we blurring the lines now between grand opera and lighter opera and musical comedy? TU: I think there is a bit of that going on now. BD: Is that a good thing to blur those lines? TU: I think so. One should be able to go from one to the other. I don’t think that all musical comedy would be suitable for opera singers, but there are certain things in musicals that are very possible for an opera singer. I did some of that, and it’s certainly being done by quite a few of the younger ones in particular. BD: In the musicals and in operas like The Magic Flute, you go back and forth from speaking to singing. Is that particularly difficult on the voice? TU: Yes, it is. It’s something that is difficult for an opera singer, in particular. One has to keep the voice placed at all times. When you’re doing dialogue, you can’t sit on it and expect to come back and sing with freedom. If you’re not careful, you can get hoarse. I would say that opera singers would find it very difficult to do a role in something like Kiss Me, Kate where there’s a lot of speaking, without doing some very careful planning. BD: When you were onstage, did you portray a character, or do you become the character? BD: Can it ever become dangerous, though, that you become too wrapped up in a character? TU: [Laughs] Well, that’s never happened to me, but I suppose if it were some kind of very evil role, who knows what could happen? [Both laugh] I would say in general, no. It never can be over-done. BD: If you are the character onstage, then when do you lose the character — when you walk off stage, when you’re back in the dressing room, when you’re back home, the next day? 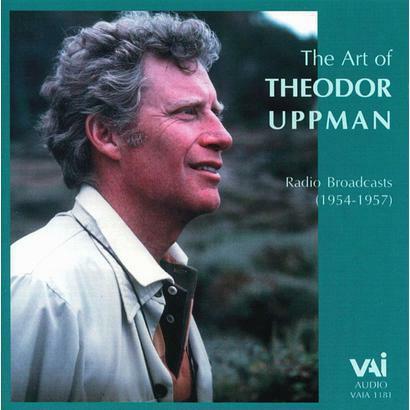 How long does it take to become Theodor Uppman again? TU: When I’m doing a performance, I don’t like to be disturbed by anything. I know some singers stand on the side of the stage and joke and so forth. I can’t do that. I have to be constantly in command of that character. I want it to be so much a part of me that I can’t be swayed from it, and I don’t lose it until I’m back in my dressing room afterwards, and taking my makeup off. Even then, sometimes it takes me a little while, especially when I’m doing something that’s very strong. Pelleas, for instance, used to affect me very much. It took me quite a while to get out of it, and Billy, too. I felt so close to that character that it sometimes took me quite a few minutes to regain my natural or supernatural self. BD: What about the applause at the end of each act? Does that break your attention at all? TU: No, no, I don’t think so. Even with the applause, I’m still realizing that they’re applauding because they feel I’ve done a good job of being whatever it is I’m doing. BD: So they’re not applauding Uppman, they’re applauding Budd? TU: I don’t like that idea, no. Naturally I like people to come up to me and say, “Gee, you’re a very good singer. I’ve enjoyed your performances,” and so forth. But in the opera house I like to be applauded for the person that I’ve been. Naturally, you do get some feeling of the fact that you, yourself, are being applauded, too. But I’m not the kind of person who likes to get out and milk the audience! BD: Does this change when you’re doing a concert or you’re doing a sacred piece, rather than an operatic character? TU: That’s difficult. I have been in some audiences. I used to begin my recitals with a religious thing, a chorale, written by Christoff Stratner, called “I Pray to Thee.” I would begin my program, and in some communities there would be no applause after that, which was fine. They feel it so deeply and that’s the way they would like to respond. I would say in most cases they did applaud, but there were times when that felt like a religious moment, and there should not be applause. I liked it, really; that was a good thing. But naturally, a recital is different. Perhaps there you are portraying some feeling or some character in each thing you’re doing, and you’re within it as long as that’s on. But then you have to get out of it to go on, so I’m perfectly willing to accept that applause. I think that’s a very joyful and very happy moment. BD: It helps make the transition into the next piece? BD: I wanted to ask you about the differences between the two Mets. You sang in both the old Met and the new Met. What were the differences, and is one better than the other? BD: So, is it better for the baritones? TU: I don’t know. I don’t think so. I liked the old Met, too. I think the sound was better in general there. It’s like what they say about violins and stringed instruments — they used to put them behind the organs in the organ loft to absorb the sound. This old opera house had absorbed all the sound of Caruso and Tibbett and Melba and all of these great singers who sang on that stage over the years. To get that quality takes time. It’s like learning to sing — a hall improves with time if it’s taken care of properly. They’ve changed the inside of Carnegie Hall, and it isn’t the same sound. It isn’t as warm; it has a brittleness now, I feel. It’s the wood they put into that new stage. That wood, after all, is an instrument, like the casing of a violin. It seems somehow or other to gain in its ability to resound better as the years go by. I don’t know whether they used beech, but certainly not pine. It may be that my ears are just so used to the old sound that I can’t get used to the new one. A lot of the critics have been critical of it. I don’t think it’s quite the same quality. BD: How is the Opera House in Chicago? TU: I liked it there. I don’t think it’s ideal, but it’s not bad, not bad. Your Orchestra Hall is excellent; one of the best in the world. BD: Did you ever sing at the Colon in Buenos Aires? Everybody raves about its acoustics as being so great. TU: No, no. I’ve heard that over and over again, and I’m sorry to say I never got there. It’s a very beautiful opera house, too. BD: How about Covent Garden? Of course, that’s a much smaller house. TU: Yes, it’s a smaller house, and I do like the sound there. That’s one of the best opera houses in the world. La Scala, of course, is certainly wonderful, and the Staatsoper in Vienna. But that was rebuilt, too. They were bombed during the war. They had to rebuild that, and some people say that it was much better before. BD: I want to broach the subject of translation. You’ve done The Magic Flute in English. Did you do other roles in English where that’s not the original? TU: Yes, I did Così Fan Tutte for many years at the Met in English. BD: Do you think opera works well in translation? TU: I think that there are certain operas that work very well. The Magic Flute does. BD: Especially because of the dialogue? TU: Yes, and now Porter’s new translation is a very good one, although I remember the Martin translation as being a very excellent one. [See my Interview with Andrew Porter.] There were certain things (in the Martin) that were a little bit — what should I say? — not as intellectual, perhaps, as some people might like, but it was a good translation and it went. It’s the kind of opera that can take that. Così Fan Tutte certainly as a comedy can definitely take that. The Marriage of Figaro is very good in English. I think comedies, in particular, go very well in an English translation. BD: Did you feel closer to the audience because you knew they understood every word? TU: Yes, yes, it does help. Now, of course, with your supertitles and so forth, that does, I suppose, make it unnecessary sometimes to have translation. BD: Which is better — to have the translation sung, or to have the visual translation? TU: I’m not sure. It depends if the audience can understand what’s being sung onstage, but there are some people who just never get their words across! In the long run, perhaps we’re better off doing it in the original language now, and having these surtitles. I’ve been to performances — and I didn’t expect it to happen, but I’ve enjoyed them tremendously, especially if they’re done! They have to be done with taste, with understanding. They cannot be a haphazard sort of thing. They must be done with a thorough understanding of what’s going on, and the timing is very important. If that’s not done properly, then I would rather not have it! BD: [Laughs] Right. A number of singers that have worked with them are saying that in the comic operas they get two laughs — one when the audience reads it, and then when they sing it and do the action. TU: Yes, it’s true. I know the Met doesn’t want to do it. I don’t know whether Jimmy Levine is against it or what, but it’s something they’ve said they will not fall into. BD: But they permit them on the televised presentations. TU: Yes, yes, that’s right, so I don’t know why it shouldn’t work the other way. BD: Do you think opera works well on television? TU: I do, yes. Certain operas that don’t go at all in the house go very well on television. There’s much more intimate contact with the television, especially if you have someone with an understanding of the opera. Again, it has to be done with taste. When that is accomplished, it can be a very wonderful thing. For instance, the Turandot which was done from the Met was excellent. I loved it. There were things there that people just don’t see at all from the audience that they were able to convey. It went very well on television. BD: If they don’t see something in the audience that they’re supposed to see in the theater, and yet it’s brought forward in the television, is that the fault of the director, or is that some extra brilliance on the part of the television director? TU: [Laughs] I don’t know! BD: Obviously, Puccini didn’t have this in mind. TU: Puccini didn’t, no. I remember a wonderful televised production of Butterfly with Freni. Certainly Puccini wouldn’t have been unhappy with that. BD: Are you optimistic about the whole future of opera? TU: Yes, yes, I am. There are some rather strange things being done these days. Some of the operas that are coming along are, I feel, hardly worth it, and that’s a shame. If they’re going to be done, if an opera composer is going to have his works done, he’s got to find a way of writing them so they can be sung and understood by the public — at least in most respects. I do think we have to take chances; that’s always been done. You have to find new ways of presenting the musical line, and modernize if we possibly can. But you can go too far. There’s a moment where you lose all the potential if you’re not careful. BD: Is this the advice you have to young composers coming along? TU: Yes, I think so. It’s just that they ought to really speak with a lot of singers and other musicians who have been through it, not just say, “Well, this is my feeling.” It’s a shame when something is written, and it then gets presented and it’s a flop because they haven’t taken the time to realize what will go and what will not go on the stage. BD: Let me play devil’s advocate for a moment. We all know that La Traviata at first was a flop and Carmen was a flop, and yet these are great operas! TU: Yes, I know. As I said, something like even Gloriana was not a success to begin with, and now it’s a very wonderful opera. It’s possible for that to happen, certainly. I haven’t seen the opera yet, but I’m looking forward to Nixon in China. I wondered whether that would be something that would go, but I’ve had several friends tell me that they had seen the production and were thrilled with it. I’m certainly for anything that will be an advancement, even if it’s maybe a little bit far out. BD: What constitutes greatness in music or in opera? TU: I really don’t know quite what I would say about that. One has to have, first of all, a libretto, a story that inspires you, and will, in inspiring you, bring you to the point of creating beauty of some sort — whether it’s dissonant or whether it’s something that’s completely melodious, it doesn’t matter sometimes, but it has to be done with great taste and with great feeling. You have to be sincere about it. So often, people play with their abilities to compose something that they seem to throw it together like some kind of puzzle that never really reaches a point of full blooming. I don’t know whether that explains it well enough or not, but it’s what I mean by it. BD: There are so many operas that have been written. Should an opera company like the Met or Chicago only do the great operas, or is there a place on the stage for works we know are lesser-lights? TU: They certainly should not neglect some of the lesser works. Composers of today certainly deserve to have their works done — if they’re worthy of being performed. We have to be careful. In many cases, the cast is very important. If you don’t have the right people to do an opera, and it’s a work that’s very difficult, it’s better not to do it than to go ahead and present it in a haphazard way. Then it probably will be said, “Well, this opera is not worth it.” I think many times it’s the cast that makes the difference. BD: We are also talking about taste. Isn’t taste something that goes in cycles over years, that changes? TU: I guess it’s true, yes. In history, we’ve gone through periods when people have been very involved with religious or proper lifestyles of one kind or another, and are afraid to do anything that is perhaps risqué. Today, of course, we can do just about anything as long as we do it with the right style and with understanding. But I guess I’m really not sure. I’m not a historian in that sense, and I haven’t thought about it; I guess that’s the main thing. But I certainly remember when I was growing up we heard only the standard operas. We never had a chance to hear anything that had been written in this century, especially. BD: Let me ask a balance question. Is opera art or is opera entertainment? TU: It’s both, isn’t it? It’s got to be. It is an art, and if it’s going to appeal it has to be entertaining. The greater the art that is composed into an opera, the more entertaining and more appreciated it will be. Just the fact that it’s art is not necessarily going to mean that it’s going to be appreciated, but if it’s done with great beauty and with a great sense of expression and creativity, I think it’s bound to be appreciated and will entertain. BD: One other balance question — the “Capriccio” question. Where’s the balance between the music and the drama? TU: I would say that there are some composers who really have done it. Benjamin Britten is someone I go back to many times. Think of what he did with his last opera, Death in Venice; the simplicity with which that opera is put together! I’m speaking of the music. There’s very little underneath; it’s a chamber orchestra, and many times very little instrumental work going on, but it’s so expressive! It is just exactly what’s needed at the right moment for the character and what he’s saying. This is the trait of someone who is a real genius. Verdi did it with his works, as did Puccini. They all had something that would bring out the full essence of what was needed for the moment of the drama. That’s a God-given gift that is just overwhelming. TU: Yeah! It has to be fun! [Laughs] I would never have done it if it wasn’t fun. You can describe fun in different ways. It’s a great excitement to get on the stage and to sing, and then to realize that your voice is expressing what you really want it to express! I really don’t know that I could have continued living if I hadn’t been able to do that. One gets to that point in a career — once you’ve had that feeling, it’s something that you want to continue and continue. It’s happy, and it’s fun many times. Sometimes it’s very emotional. It can tear you apart when you do some of these roles that are very dramatic and soulful. It’s not easy to do, but if you do it and do it well, it’s great satisfaction. BD: We spoke earlier about doing evil. I can’t think of any of the roles that you did that were evil characters. You did all good characters! TU: Yes, I guess. I’m trying to think — did I ever do an evil character? I’ve done some conniving things. I always wanted to do Scarpia. That was one role that I failed to do. I didn’t do it anywhere, and I think that would have been the one role that, evil as it is, I would have loved to have done. It’s a great role. TU: You don’t know me that well! BD: Just knowing you on the stage, is it a failing on my part that I can’t see you in this character? TU: I don’t know. I’ve never done it, so I’m not sure; but I think I can. When I do concerts, I’ve sung the “Credo” from Otello, and apparently, according to critics when I’ve reviews, they said I did it with a very telling effect. So it’s possible. I’ll have to see one of these days. When I get to be eighty I might do that! BD: Are you doing any stage directing now? TU: I have done some; I’m really not involved that much with it, though. I’ve been teaching now for some years at the Mannes College of Music in New York, and one fall semester I did the scenes for the youngsters there. I enjoyed doing it very much. Then I directed The Magic Flute a couple of times in various places, but I’ve not really taken it on as a career thing yet. BD: Thinking about the vocal students you’re teaching now, are you encouraged by the raw talent you’re getting? TU: Some of it. I have one pupil right now and I think she’s going to be really a very fine talent. I don’t want to say too much about it yet, but I do think she’ll appear one of these days on major stages. She’s a young lady who has just turned twenty, and she has really had not background at all in classical music. She loves to sing, and she came to school just about a year and a half ago, not knowing one operatic aria, never having seen an opera! BD: Then why did she want to be an opera singer? TU: She just suddenly heard these things. She’s heard recordings, and she just absolutely fell in love with the idea of becoming an opera singer. I must say, today she is getting there! The people who have heard her have been just amazed. They think, “You must have been doing this for several years,” but not at all! She had no idea of what it was all about. It’s one of those cases where you have somebody who feels and understands and can grasp what it’s all about! It’s amazing. I had her here for a lesson this afternoon, and she’s got two new roles. She’s going to be a wonderful Mimì one of these days, and also Despina. BD: What is her name, so I can watch for her? BD: Is someone with her naïveté about the whole career business more likely to make it because she hasn’t been clawing and scraping her way for fifteen years? TU: Yes. At this point I’m so glad she came to me when she did, because if she’d waited longer and had not been with a good teacher, heaven knows what would happen. I have to stop her every once in a while because she has such enthusiasm, and would continue to sing with great power up above. You have to be a little careful about how you approach notes, and so forth. But she’s learned to do that, so I don’t have that worry now. But it’s true that young singers are tempted by many things. They want to become great singers immediately. I don’t care what kind of voice you’ve got or how great your talent is. It doesn’t happen overnight! BD: One spends fifteen years becoming an overnight success! BD: Is this the advice you have for all singers — to be patient? TU: Yes, I would say that. You have to have great patience, and you have to believe in yourself, too. This is the thing, I think, more than anything else. You have to say, “I know I can do it! I know I can do it, and I’m never going to give up!” At the same time, you have to use your head and you have to listen to people whom you can trust. Take what they have to give you, but only take what you know works for you. Don’t just say, “Oh, I’ve got to do it that way, and that’s it.” You have to be careful. You have to listen to yourself. You have to realize what your limits are. If you’re a lyric soprano, don’t try to sing Aïda, for God’s sakes! BD: Doesn’t this put too much responsibility on young shoulders, for them to know what is too much for them or the wrong thing for them? TU: They’ve got to have someone guiding them, that’s true, and I hope it’ll be somebody who has sense and understands what the situation should be. There’ve been a lot of young singers who have not reached their potential, mainly because they tried to do it too fast and they have had the wrong kind of teaching. You can name several things, but I would say also that many of them don’t have enough desire to think, “Well, if I don’t make it this time, I’m going to do it next time.” You have to have that! You’re not going to get there if you don’t have that. That’s my feeling. TU: Thank you. I have loved it. BD: Thank you for spending time with me today. I appreciate it very much! TU: Thank you, Bruce. I’ve enjoyed it very, very much. I hope you’ll have many, many years of continued success with your program on WNIB. 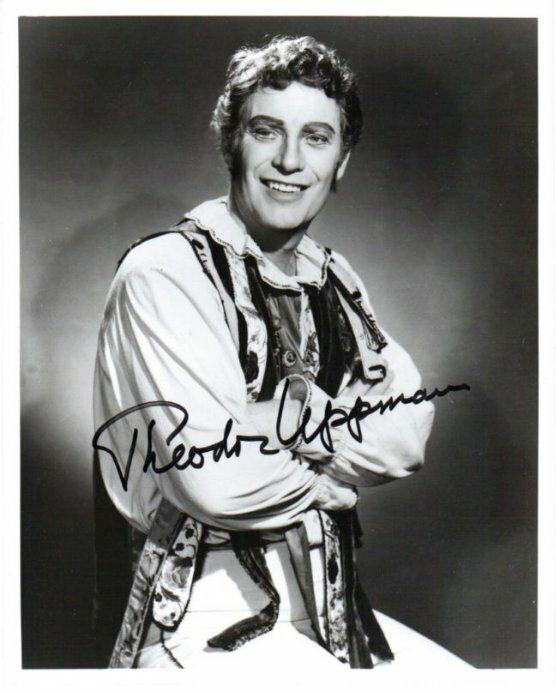 Although the baritone Theodor Uppman, who has died aged 85, will always be recalled in this country as the creator of the title role in Billy Budd, at Covent Garden in 1951, he was renowned in his American homeland for a wide variety of parts, all suited to his handsome presence and attractive voice. These included the name role in Carlisle Floyd's Passion Of Jonathan Wade (New York City Opera, 1962) and Bill in Leonard Bernstein's A Quiet Place (Houston Opera, 1983). Benjamin Britten originally conceived the part of Budd for Geraint Evans, then at the threshold of a distinguished career, but Evans - primarily a bass-baritone - found the tessitura of the part too high, and was assigned the role of Mr Flint. Uppman, whose career seemed to have stalled after a promising start, had worked with Alfred Drake on a Broadway musical. When it became known that David Webster, then general administrator at Covent Garden, was in New York auditioning for a Billy Budd, he persuaded Uppman to enter the fray. Turning up at the audition, tanned and blond, Uppman seemed ideal material. His voice was taped and the results were taken back to Britten with a strong recommendation from Webster. He got the job, and Britten was delighted. His ideal for the role - a baritone who was youthful, enthusiastic and innocent-looking - had been completely fulfilled. The critics praised Uppman as much as the opera itself. I recall how fresh and spontaneous an interpreter he proved to be. His looks and mellow, yet virile, tone, allied to a seemingly natural gift for portraying a strong, yet still boyish sailor, were unforgettable attributes, and he made his solo, when condemned to death, as eloquent as it should be. Soon afterwards, he took the part at the first American performances, on television, and he went on to sing it elsewhere until 1970. Latterly, he coached other baritones in the part, notably Simon Keenlyside. He soon formed a connection with Aldeburgh, and taught until recently at the Britten-Pears School at Snape, of which he became an honorary director. Uppman was born in San Jose, California, to a family of Swedish heritage. 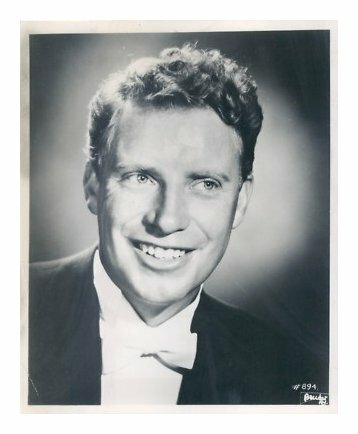 He studied at the Curtis Institute, Philadelphia (1939-41), moved on to opera workshops at Stanford University (1941-42) and the University of Southern California (1948-50). He first sang in concert in 1941, but his real debut came in 1947, as Pelléas in a concert account of Debussy's opera with the San Francisco Opera. His partner was Maggie Teyte, the eminent interpreter of Mélisande. This was the role of Uppman's debut the following year at the New York City Opera, and for his first appearance at the Metropolitan, in 1953. Later, he also proved, at the Metropolitan, a perfect Papageno, with Bruno Walter suggesting that he was not just singing, but also being, the part. Uppman went on to sing some 400 performances of 15 parts at the Met, though seldom anything heavier than Mozart, or Sharpless in Madama Butterfly. He was particularly admired as Harlequin, in Richard Strauss's Ariadne Auf Naxos, and Eisenstein, in Johann Strauss's Die Fledermaus. A late appearance was as the seven mysterious baritone figures in Britten's Death In Venice, at the Geneva Opera. He taught until recently at the Manhattan School of Music. 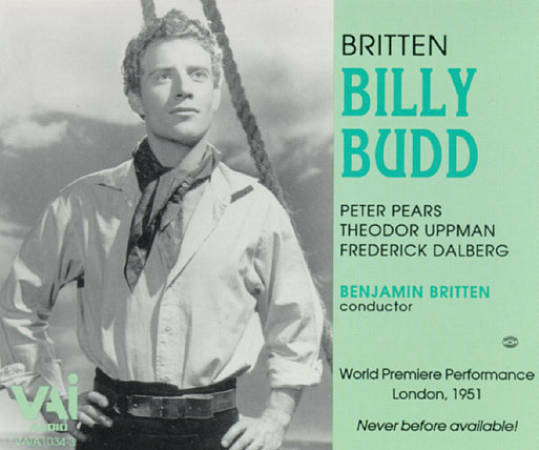 Not long ago, a set of recordings was issued of the premiere of Billy Budd. It is aural proof that the original verdicts of his supremacy in the role were not exaggerated. He is survived by his wife Jean, whom he married in 1943, and their two children. This interview was recorded at Mr. Uppman’s apartment in New York City on March 22, 1988. Sections were used (along with recordings) on WNIB later that year, and again in 1990, 1995 and 2000. It was transcribed and posted on this website in 2012.